Q: Is your grain organic? A: Our Emmer wheat is grown on land that is certified organic by Organic Certifiers of Ventura, CA. Our Hollister growing grounds are one year from certification and all production for the past 3 seasons has relied on organic farming practices though we can’t yet call it organic. Our wheat is natural and nutritious. Grain is grown to rest soil and is an important piece of sustainable farming practices. It takes 9 months for a planting of wheat to reach maturity. Often these plantings are dry farmed and the natural growth cycle allows for a great deal of biodiversity to flourish. Our 2016 crop was self-seeded and dry farmed. The soil was not tilled but allowed to rest for over a year. This allows the microbiological communities in the soil to flourish and the resulting crop looks fantastic. We save a percentage from each harvest to use for the following year’s crop. 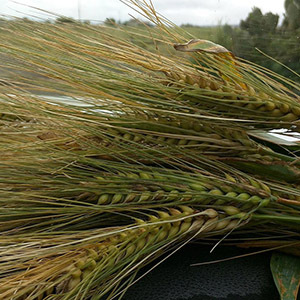 We spend extra money to keep our wheat varieties separate and preserve their identities. Our bread and pasta products are made from identity preserved grains that retain the full complement of their whole grain nutrition and flavor. Q: How do I store your grains and grain products? A: Our flour and wheat berries can be stored in an ordinary pantry for one year without any problems; people living in more tropical climates like to store these in the freezer but it is not really necessary in Southern California. Breads can be stored in their bags, on the counter for several days without staling. If you want to wrap the loaves in foil or clean kitchen towels they will last a week. Freeze breads for longer storage by wrapping in foil or a zip lock bag. To thaw, place frozen loaf in oven for 25 minutes at 375°. A loaf that has dried out on the counter can be refreshed by running the loaf under the faucet very briefly, then popping it into the oven for 15 minutes at 375°. Q: How is your flour milled? 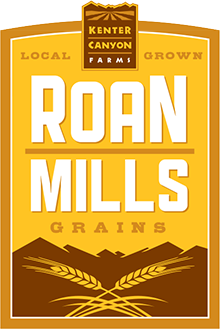 A: We use Meadows Mills, either an 8 inch or a 20 inch mill, to grind our grains. The most important thing about our flour is that it is whole grain flour, all the flavor and nutrition in the wheat berry is in the flour. The quality of this informs everything you create with our flour. From chocolate chip cookies to pasta to bread the color and flavor of this flour is like nothing else. Flour with flavor, flour with nutrition and it is very easy to work with, just increase the liquid in your recipe by 15% and continue as before.